The DMCA states that a forum post on forums.watchnet.com published in 2005, was copy-pasted on RipoffReport.com after 3 years. It seemed as if the webmaster of the forum carefully checks for copyright violations for any single forum post (among hundreds of thousands of posts), and decided to file just 1 DMCA. A single copyright takedown notice after three years. We were skeptic, and got confirmation once we messaged the admin of watchnet.com. He filed no such DMCA. Someone (probably a rogue reputation firm) impersonated Watchnet and filed the bogus DMCA notice against RipoffReport. The name ‘Bob Wilson used to file the takedown notice has no connection or relevance to Watchnet. 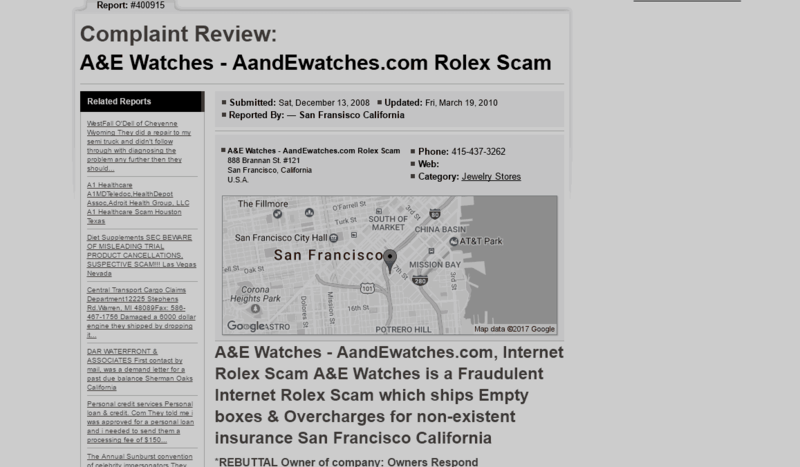 A&E Watches – AandEwatches.com, Internet Rolex Scam A&E Watches is a Fraudulent Internet Rolex Scam which ships Empty boxes & Overcharges for non-existent insurance San Francisco California. And A&E Watches did no good by trying a fraudulent method to confront these allegations. Now, we’re not so sure these allegations are fake.